Well, I missed Adalyn's 1 month update but finally got myself together to do a 2 month update. My girl is 2 months old today!! Also, I turn 25 today! I want to remember the little things she is doing right now and share with all of you in case you have young children of your own. 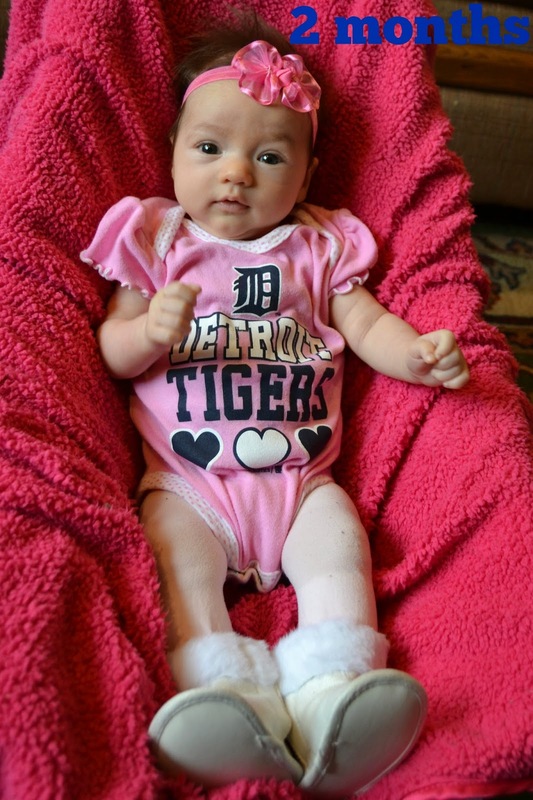 Clothes size: Adalyn wears pretty much all size 0-3 month right now. Feedings: Adalyn is exclusively breastfed. She eats 6-8 times in 24 hours. She usually gets 1 pumped bottle per day from Troy. She loves to eat. We are loosely following Babywise which has us feeding her at least every three hours during the day, sometimes more like 2 1/2 hours. We do not have an exact set schedule but always try to do a full feeding as opposed to "snacks" and keep her awake to play after each feed. Also, we try to fill her little belly up a lot during the day so that she does not have to eat much at night. Baths: Adalyn has started to love baths, especially with Mom. She enjoys floating around in the water but HATES getting out. She screams from the time I take her out of the bath until she is fully dressed. Sleep: Starting at about week 6, sleep has gotten so much better once we started putting her to bed earlier. Many times, it takes a long time (1-1 1/2 hours) to get her to sleep but before, she was not going to bed till 11 or 1 which I thing is way too late for a baby. Now, we start putting her down at 7:30-8:30. She gets a diaper change, swaddled in a Halo swaddle and then fed. We then put her down in her crib and turn on the baby monitor. A couple times, she has fallen asleep just like this but not usually. We usually have to turn on her Sleep Sheep and put her pacifier in a few times. Once she falls asleep, usually around 9-9:30 PM, she either sleeps till 3:30-5 before she needs another feeding or if she fell asleep earlier, Troy will feed her a bottle around 11. We do not have this worked out perfectly yet but it is going so much better than it was prior to 6 weeks old. I love that I am only feeding her one time during the middle of the night which helps my sanity so I am not exhausted. She then sleeps till about 6:45-7:30 when she is fed again. We are loosely following Babywise which is going well. Adalyn takes a couple of naps through the day, usually mostly in the morning. We do not have her on any nap schedule but she just sleeps wherever she falls asleep. -Wubbanub- We have the red dog and the brown puppy Wubbanubs and literally have them within reach at all times and never leave home without them. Adalyn loves these so much. -Halo swaddles- We found out that on Adalyn's 1st night home, she can bust out of any swaddle and then her hand movements wake her up. The only swaddle that works for us is the Halo ones. We have 4 of the newborn size and 2 of the small size. We use these every single night. -Boba carrier- We love our Boba carrier which is awesome to wear into a store or to take on a walk. It is comfortable and Adalyn likes it. -Solly Baby Wrap- This is our other favorite carrier. It is so soft and comfortable and I love having Adalyn wrapped so closely against me. Milestones: Adalyn has started smiling more. This makes us so happy! She has also been staring at people's faces for long periods of time, is more alert and is starting to be able to track objects with her eyes when you hold them in front of her. She does not love tummy time but is quite good at holding her head up. Likes: Eating, her Wubbanub dogs, staring at people's faces, standing (while we hold her of course), dancing with Daddy, bath time, being held, walks. Dislikes: Being cold, diaper changes, getting out of the bath, being hungry, when the pacifier comes out of her mouth. -Ava started to love Adalyn!!! She watches over her and comes and lays on me when I am feeding her. This makes me so happy! -Adalyn went to my parent's farm twice this month and did awesome. She sleeps so much better there than at home. We went on a tour of the farm and showed her everything. -We have been able to go out to eat a few times (for breakfast or lunch mostly) and she has done very well.